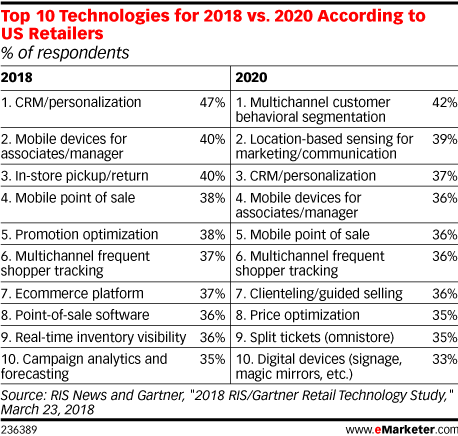 Data is from the March 2018 RIS News and Gartner "2018 RIS/Gartner Retail Technology Study." 90 US retailers from national and large regional chains were surveyed during January-February 2018. Respondents identified their job titles as CIO/CTO (13%), C-level non-IT (17%), CMO/VP/director/manager marketing (9%), director/manager of IT (29%), manager/director non-IT (18%) and VP of IT (14%). Respondents identified their retail segment as apparel/footwear/accessories (23%), ecommerce (6%), food/drug/convenience (31%), general merchandise including department store, mass merchant, discounter (4%), specialty including electronics, furniture, hardware, home, etc. (31%) and other (4%). Respondents identified their annual sales volume as <$100 million (23%), $100-$500 million (16%), $500 million-$1 billion (14%), $1-$5 billion (24%), $5-$10 billion (9%) and $10+ billion (13%).